With the launch of Charlie Brooker's Dead Set on E4 and 4DVD, the Borehamwood outbreak is now open to Urban Dead players, with permanent zombification, fast zombies and a battle for the Big Brother house. The map will remain open for four weeks. The login page has also turned bright red with some horrid wallpaper background. Not seen the series yet, but hope to catch it on E4 when its shown this weekend. With it being from Charlie Brooker it's probably either going to be funny or totally condescending to its viewers. Hope this one turns out better than the Diary of the Dead promo tie-in. That failed initially due to the permanent take-down rule for both zombies and humans and the fact that the Map of Monroeville was too big. The modifications then tilted it into a Zombie\Player Killer heaven. In fact more survivors were probably killed by other survivors than Zombies. Monroeville being based on the real-life Monroeville stateside, famous for being the location for 'the mall'. In the main Map, our survivor group is planing a bit of 'Trick or Treat' for our local neighbourhood. Normally on Halloween in Malton things get a little different, with shops suddenly having sweets available to loot, and Zombies the ability to knock on doors! Also according to the spellchecker: Nearest match to zombification is syllabification; which could do with exactly that. A small GQ3 WW2 campaign has got under way based on an hypothetical attempt by the Japanese to reinforce\relieve their bases in the Aleutian Islands from American attack. Japanese: Martin (C-in-C), Jack, Tel. Hot-dog Munchers: Matt (C-in-C), Colin, Alan. The first set of hidden map moves have been completed, and, as I'm not totally daft, I'm not going to say what our sides moves were! Basically the first day (of three) is now over with no surface engagements and only a brief air-battle over a U.S. base to worry about. With some time left to burn at the end of a night a quick(ish) game of Wings of War took place, a DH4 and a Snipe vs an Albatros DVa and a Fokker DVII. Using the altitude rules complicated things a bit and the table was probably too big an area to play on as well. Would probably of been fine with more planes. In the end the allies managed to scrape the win, shooting the DVIII down and forcing the Albatros off board. Little did the Germans know just how close both allied planes were to going down, one more 2+ damage card each could of done it. Also news of Series 3 minis; now supposedly being released sometime in November. Hopefully not too late else things are going to get caught up in the Xmas mail surge. An historic scenario in more than one sense. This game also heralded the suprise return of Jack, who's not been seen at the club for a few years. At the start things don't look too good for the Japanese with only the solitary squadron vs the combined fleet of Brits\Aussies\Dutch and Yanks, but things should soon improve with the rest scheduled to come on soon after. The Brits split off from the main group, heading to starboard with the Exeter in the lead. Their destroyer screen was eventually reduced from three ships to one, but they did manage to get their torpedoes off and sink a Japanese destroyer. The main body of the Japanese arrive and actually make good use of some spotter planes to do some long range gunning. The Dutch also had a spotter available but failed to lauch it in time. Waves of torpedoes are crossing each other as the Japanese fire off their long lances as the British try to close to the effective range of their own torps. Formations become difficult to maintain as damaged ships start to slow down. Soon ships are exploding everywhere, particularly the lead destroyers. Things ended up much bloodier than the historic outcome, with torpedoes from both side causing havoc, In GQ3 they do seem very powerful. But the final result was the same with the allies taking a pounding with a number of their ships disengaging due to excessive damage. In other news, Martin has announced on the Shipwreck Yahoo Group that he plans on developing a new edition of the rules with the assistance of the group members. This has come as a bit of a surprise. Warhammer Historical have chosen the anniversary of the Battle of Trafalgar to announce their forthcoming game Warhammer:Trafalgar. This game is a completely original rules set, designed for fast-play fleet actions and more detailed small actions. While I've tried to stay very faithful to the tactics and history of the Age of Sail, it's not a slow-paced simulation - there are lots of games out there already that offer this option, so I didn't want to duplicate the same principles. The sailing phase is, not surprisingly, the most in-depth part of the game - manoeuvring was the most important part of any battle between sailing ships! It has quite a detailed campaign in the book, based on the Campaign of Trafalgar (obviously), with historical fleet rosters for all the battles. The basic campaign system can readily be ported across into a campaign of your own devising. There are six standalone scenarios too, for pick up games of any size. The book is packed with ship schematics and rosters - every type of vessel I could pack into the book is present, and each ship has an individual roster sheet (a bit like Man O War), with tick-boxes for damage, etc. I'm really proud of the hobby section - for the first time I can think of, naval wargamers will have access to a painting and rigging guide that uses close-up, step-by-step photography. Plus a scenery guide too! 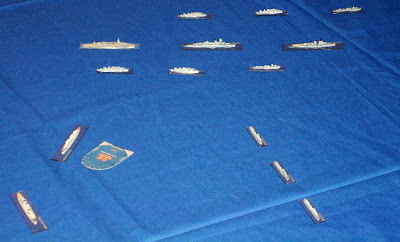 Finally, the game is nothing to do with Legends of the High Seas - it's standalone, but I have spoken to Tim Kulinski about a possible link-up in the future, so perhaps the Trafalgar rules could be used for fleet actions in a larger campaign, while the LOTHS rules could be used for skirmishing... it's up to the players, I guess. Fingers crossed that it'll be a good one. It was almost a mass no-show at the Furness Wargamers, with a number of regulars missing and only a handful of games running. Fortunately Martin turned up eventually, bringing his Battletech stuff with him. Strangely enough the bloke who wanted to see what the game was all about (he's had some gaming stuff handed down to him) was one of those MIA. Having nothing better to do we rolled up some Mechwarrior characters, and a right odd bunch they've turned out to be. Given that they reside in classic era (3025) Steiner space that's probably appropriate. Everybody I know who's played the game thinks that Battletech went pear-shaped with the Clans. No chance of them psychos interfering as Martin's stuff predates their introduction and is firmly Succession War era (and his rulesbooks are almost antiques!). Using the age old method of naming things after the first thing you see... My character is Norbert McVitie, pilot of a 50 ton Trebuchet Mech called 'Hobnob'. He has newly transfered to the 32nd Lyran Guards, on Solaris, from the 5th Lyran Regulars, where he conducted his apprenticeship, The rest of the PCs in the lance consists of a T-Bolt and a Catapult Mk2 piloted by Marcus Vine, who's also been transferred in but from the rather more posher 11th Lyran Guards, and he actually appears to of had some education. Hopefully we'll get to play a few mech battles with this crew in the future and get a bit of a campaign going. A raid into Kurita or Marik Space looks to be in the offing for starters. A General Quarters 3 scenario based in an undisclosed part of the Pacific. Despite the scenario being U.S. vs Japan that did not stop us from going Ding! Ding! before rolling the D12s. 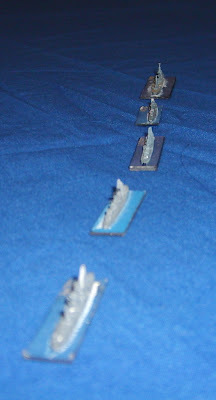 The Japanese had deployed in line astern but turned slightly towards the enemy. The U.S. had to turn/slow pretty sharpish to avoid the risk of running aground on the islands, preferring instead to run the risk of hitting their own ships. The main TF split, the Battleships staying behind the islands while detaching its destroyer screen towards the main enemy TF. Rather than set the guns against like for like ships, most shots were sent towards targets lower down the food chain, the Japanese destryers in the main group getting a couple of nasty salvos off the U.S. Cruseirs. The 3 U.S. Battleships concentrated on the force coming around the island and managed to hurt and slow down the cruisers. 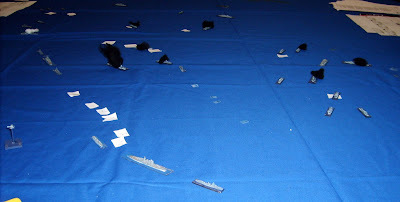 With a wave of torpedoes coming from Dave S's main Japanese force evasive maneuvers were needed from the U.S. to avoid not just the torps but their own ships. 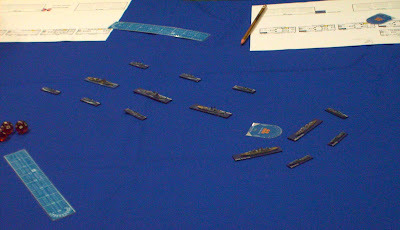 With Colin's destroyer screen surviving their head-on charge towards the torpedoes, but his Battleships taking a few hits from the ones directed at them, the game was declared over. Everybody agreed that the rules worked OK and there is talk of a possible short campaign based in the Aleutians. Also of interest was the conversation on NavyField an online WW2 naval game that an increasing number of locals are playing. Have received a status report from Dave M including details of the casualties (but not the point values!). I have added the percentages. A quick update on how the campoon is going at the moment. Scores on the doors are Goodies 8 wins, Baddies 7 wins (with one game outstanding). At the moment Goodies are 1 point up. What the above does not include is the amount of horse\warg flesh left littering the battlefields. A number of high value and\or mobile units have bitten the dust. The battle between Mordor and Gondor was a bit of a shambles with zombies probably being more aware than the two commanders, both of whom were feeling like death due to assorted ailments, and neither of them 100% sure of the rules. Numerous mistakes were made in combat resolution including a major one that should of tilted the result Gondors way. Leaders were dieing all over the place. The Mouth of Sauron got stomped trying to reinforce a Orcish Warband, but then the Gondorian command group and attached cavalry got flanked and wiped out. The Trolls managed to bounce off a Gondorian Shieldwall defending\hiding in a village. The Gondorian Archers managed to do considerable damage (partially due to a misreading of the massed archery rules) before being hit by a couple of warbands. Fortunately for them they managed to do a good rout and escaped OK.
A Mordor victory but in a very unsatisfactory manner. Meanwhile at Helms Deep the pesky elves managed to pull off a surprise victory against the forces of Saruman after hiding behind a apparently invulnerable hedge. Still one more battle to do in the round as the forces of Dol Guldur (defeated in the last round) have a rematch against the Rohirrim.